I have now switched fully over to the NEW Jazzturtle.com site. This will be your one stop for all Jazzturtle info.. workshops, festivals, events, press and links to shopping- as well as my bloggy ramblings (which I promise will be MUCH more frequent). I will keep my etsy shop stocked with textile couture, handspun art yarns, felted soaps and fibers, but will also be rolling out a new bigcartel shop as well with more yarn, fiber and other goodies. From now on, please go to www.jazzturtle.com for all your updates and information! This blog will be used only for archival purposes from now on. Thanks so much!! See you on the .com! Wow.. I can't believe it's been a year since the first big fiber festival I ever vended.. Carolina Fiber Fest 2010. SO MUCH has happened in the last year.. and I'm still trying to process it all.. I'm still trying to figure how how i'm going to DO IT all.. but it's all a work in progress.. balancing all the travel and inventory.. and MAKING all the inventory.. it's mindboggling, still to ME!! 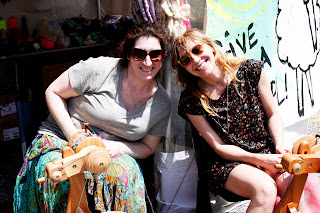 Carolina fiber fest is a wonderful festival.. close to home with great friends.. but I had NO idea what I was in store for when it came to Stitches South. Sure.. a big show I was told.. I expected it with the expo setting... I spun what I thought was 'enough' yarn.. I bought some new fixtures and I was ready to go.. so I thought.. We got to Atlanta and started setting up our booth.. and realized that what I thought was a 'professional' booth had NOTHING on some of these folks.. they used gridwalls like I'd never seen before. But I was happy with my booth.. and I'm thrilled with how it continues to manifest in new festivals.. but here's the Stitches South set up..
What a wonderful show!! NEW friends.. new contacts, new new NEW!! It was just fantastic and I look forward to a long relationship with Stitches Events!! 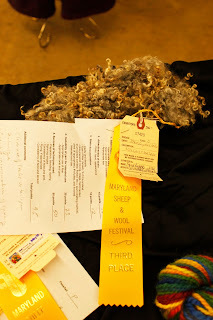 Then less than a month later it was onto Maryland Sheep and Wool festival! 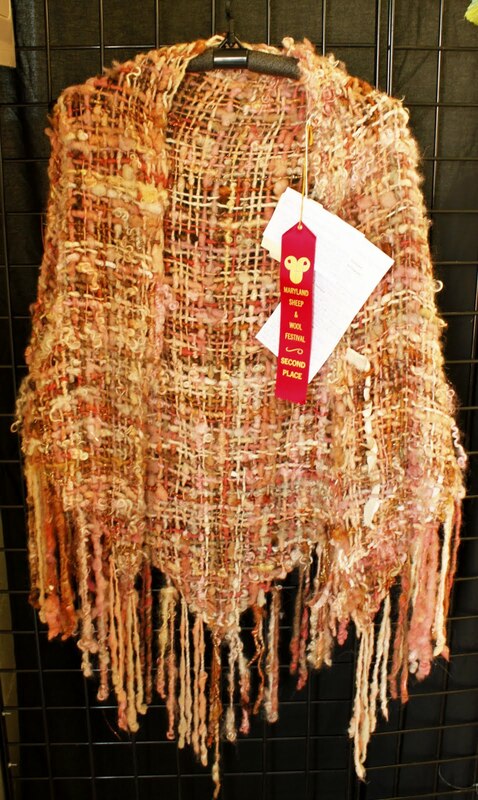 I was honored to be a featured artist in the Cloverhill Yarn Shop booth! This is one of the longest running booths in festival history, and one of the most visited! It was PACKED in the booth all weekend and my yarns and fibers were very well received. I spent the weekend bouncing between the Cloverhill booth and spending time helping my friend Lexi Boeger (Pluckyfluff) at her educational booth. We had the new Majacraft Aura spinning wheel available for trying out, as well as a Louet Classic carder out for carding. 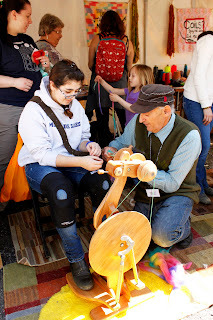 There were LOTS of yummy fibers to try for carding and spinning! It was a wonderful booth full of things to touch and play with!! It was a blast to teach all weekend! We had kids, adults.. men.. women!! 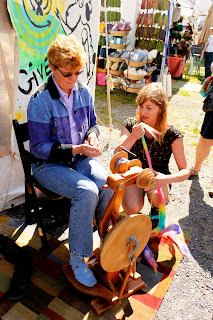 Every shape and size person sat down at a wheel or took their try at carding..
OH.. and fleeces.. DUH!! 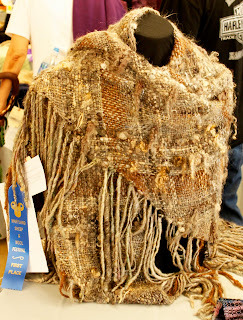 I came home with THIRTEEN fleeces.. amazing all of them.. curls and crimp.. crosses and ribbon winners! I have SO many fun fleeces to play with this summer and fall!! I can't wait to get started!! I entered some yarn into the skein and garment competition and I WON.. AND I entered a couple of my triangle shawls that I wove on my loom.. and I WON!! 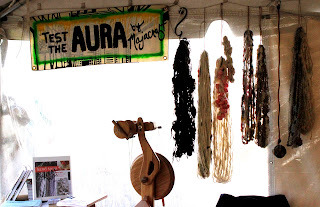 So after a wonderful weekend that Maryland was (we'll talk more about the goodies I came home with in another post- as well as the FANTASTIC nuno class I taught on Friday.. that also deserves it's own post) Only 10 days later was Carolina Fiber Fest 2011.. full circle. It was a wonderful weekend.. again full of friends and local fun! I taught some wonderful classes and we were in a large new building, that brought in lots of new people!! SO.. there was my crazy busy spring... and now I've started working on the summer and fall!! Next on the schedule is the Asheville Summer Retreat in July.. vending and teaching there.. THEN Stitches Midwest, last weekend in Aug, in Schamburg IL.. THEN a week with Lexi at her hometown workshop.. THEN home to get ready for SAFF in Oct!! I have a few posts in the works.. had some wonderful workshops I can't wait to tell you about.. but until then.. hope your dyepots are colorful and the yarn on your wheel sparkly!! The Tour de Fleece is around the corner.. I hope you have dusted off your wheel. I'll have a big update before so you can stock up.. with a discount code taboot. watch for the announcement tonight!! Pre Maryland Fiber Party is a GO with Funky Nunofelting! This has really been quite an exciting week!! I'm thrilled because the 'PreMaryland Sheep and Wool Party" is happening at Seminole Sampler which is a wonderful quilt shop right next door to CloverHill Yarn Shop (In Cantonsville MD- about 25 min away from the festival) I can't wait to see the fabric and thrums that are available! I might have to bring my pocketbook so I can buy something special to embellish my felting with! 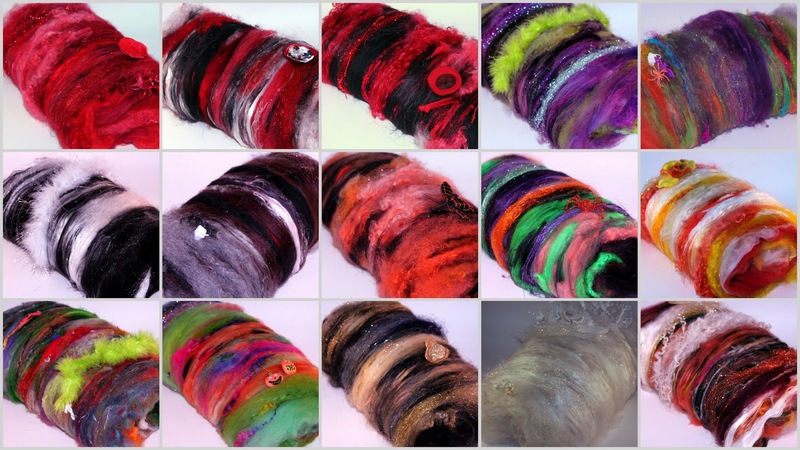 We'll be doing an extended Funky Nuno Felting workshop- giving ample time for everyone to card their own batts on the workshop carders (Louet Classic, Strauch Mad Batt'r, Louet Elite and Fancy Kitty) I will bring a large bin of fibers, novelty yarns and other goodies for you to use, as well as the needed bubble wrap, silk fabric and squirt bottle. I ask that you bring 2 towels and a pair of nylons or kneesocks you aren't going to use anymore. Also, if you have any handspun or novelty yarn scraps or textured fabric you'd like to use/bring, we'll have a large table available for 'sharing' as well. Please RSVP on the Facebook Page if you belong to FB so we can see who's joining in the fun! I can't wait to see everyone in Maryland! I'm down for a reservation at Clyde's in Columbia for crabcakes after the workshop too, if anyone wants to join me! Going to MARYLAND SHEEP and WOOL FESTIVAL!!!!!!!!!!!! I can't believe it myself! I've been floating on a cloud since I found out!! Jolene, from the wonderful Cloverhill Yarn Shop in Cantonsville, MD asked me yesterday if I would like to be one of the Independent Artists that her booth showcases at Maryland Sheep and Wool Festival! 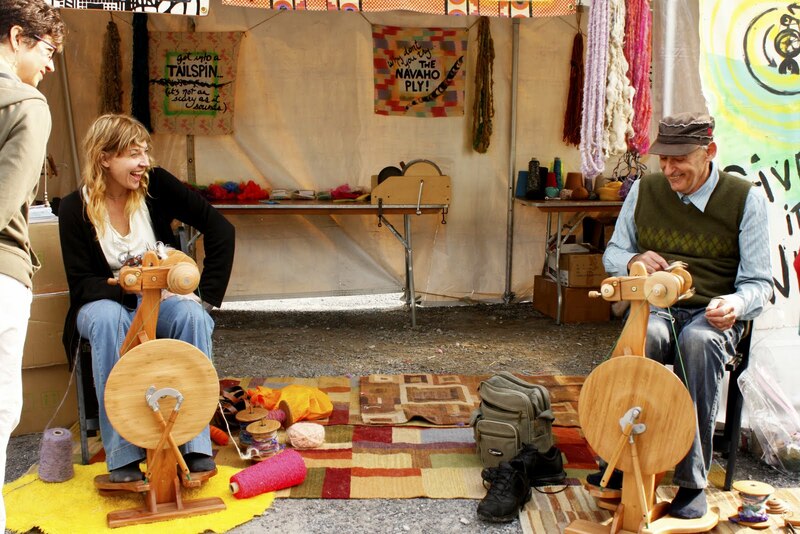 This is THE biggest sheep and wool festival in the country! I'm so excited that I have a chance to get a feel what it's like to work in a booth before I have to manage my own. Maryland is SAFF on steroids.. and so getting an idea of what I'm in for before I get my own booth is going to be a huge asset! By being featured in the CloverHill booth I'll get my foot into the door of the festival.. which is known for being one of the most difficult to acquire a booth! I'm also excited to get to be a 'shopper' in a wool market this large!! 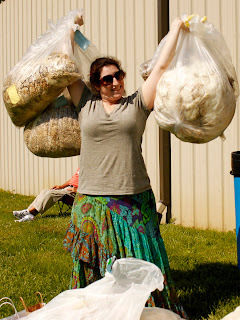 I'm really hoping to score some yummy spring fleeces, while meeting people and just general fiber mahyem! I did promise Lexi that I would help her out in her educational booth for a couple hours one day.. so I'm looking forward to quite a weekend!! My husband also just reminded me that Columbia MD (where my hotel is) is where Merriweather Post Pavillion is- where we saw Phish on our second wedding anniversary. We also ate that day at the MOST AMAZING restaurant- Clyde's in Columbia So not only do I get to go to Sheep and Wool, I get to eat the BEST CRABCAKES in the same weekend!! 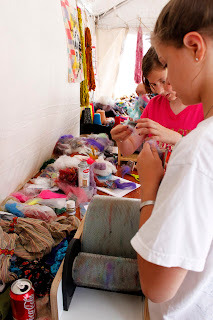 There also may be a 'pre festival fiber party" in the way of a couple workshops the Friday before the festival!! 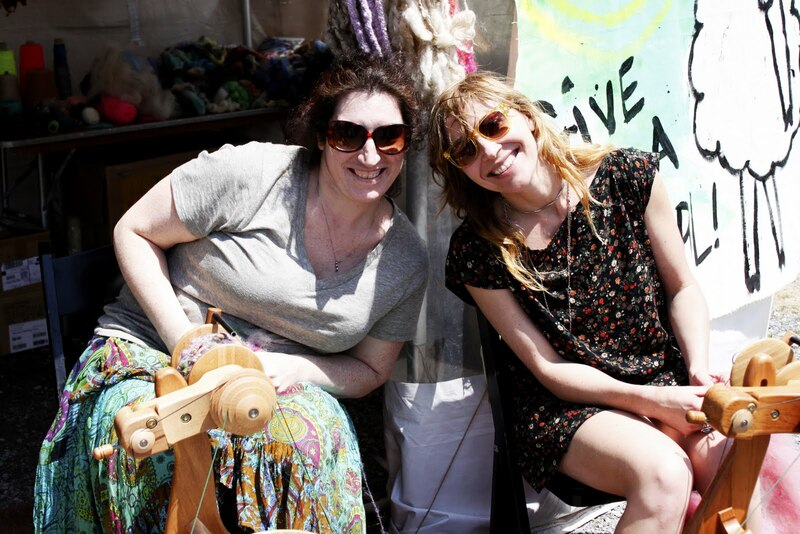 The word on the street is the Funky Nuno Felting workshop paired with the WildCarding... I'll post more info as details solidify!! YAY Maryland is going to get JAZZY this year!! in Apex, NC) wanted to host the launch party at the wonderful space Downtown Knits offers!! Walls of colorful yarn, inspiring knit sweaters and MY YARN and wearables!! I got to have a mini trunk show along with the issue release. It was a wonderful time.. we had a full house of knitters sharing ideas and playing with yarn. It was a great night by all!! JazzTurtle Creations featured in KnitScene Magazine and Knitting Daily!! I'm so excited!! This has been such a big deal for me and sharing it with you has been even more exhilarating! 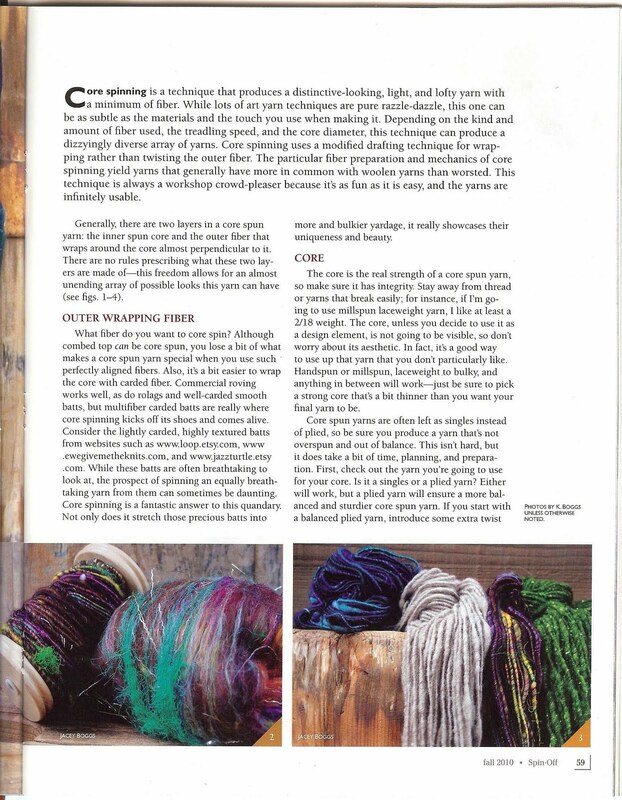 I've had 2 of my most amazing art yarns featured in KnitScene Magazine (Winter/Spring 2011) I had a wonderful shop mention (and my mother is most excited that they also mentioned my name!! Amy also gives mention to my spinning style (corespinning). The photo is just beautiful, and I have to admit I'm a bit extra geeked mine are in the middle!! 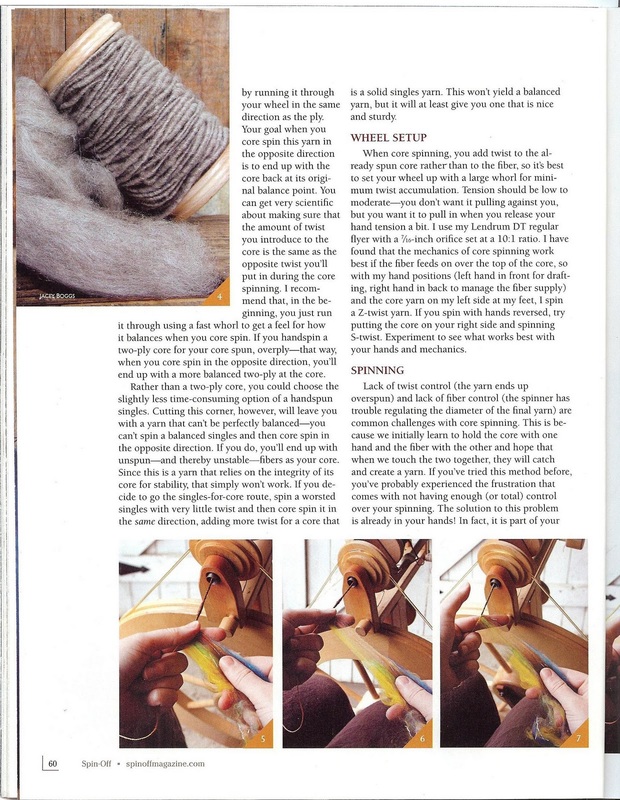 This article also had a mention in the 1/31 Knitting Daily newsletter! Knitting Daily included a mention of the shop and a link.. which brought over 400 new views to the shop that day!! Not only did I get a shop mention, but Amy posted one of my YouTube video demo's!! It's the beginning of March, and I've already had a great year of press!! Thanks to all of you who keep asking for new demo's. I'll be posting some soon!! 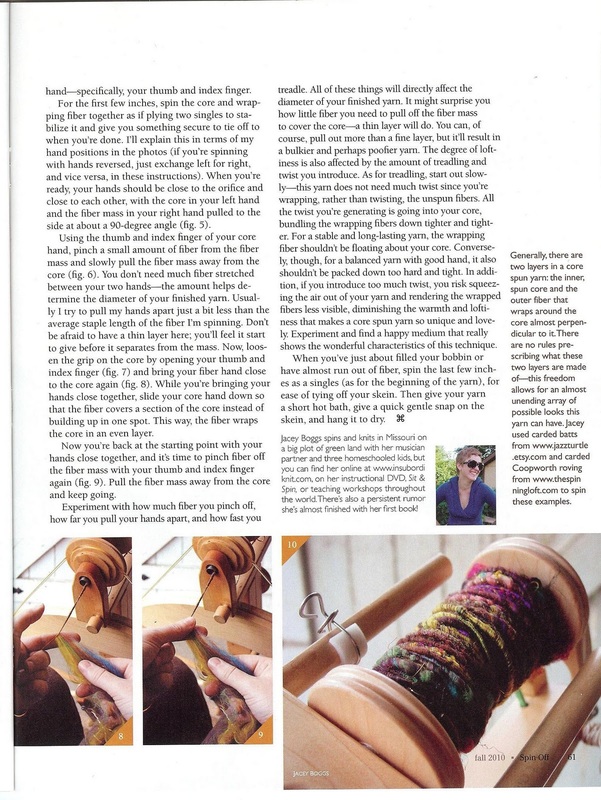 JazzTurtle Creations Batts featured in Fall issue of Spin Off Magazine! I'm so excited because my batts are used in the current (Fall) issue of Spin Off Magazine!! 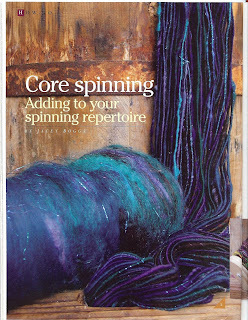 Jacey Boggs wrote a great article on corespinning and she used my batts for the piece! There's some amazing photos.. AND 2 shop mentions! I'm just giddy.. and my neighbors must think I'm crazy since I started dancing around and squealing when I opened the mailbox and saw the batts in the magazine staring back at me! This is my first major press and I can't be more thrilled!! Off to card batts for the bigger than I'd originally planned shop update this weekend!! I'm only showing a few of the photos with my fiber.. you have to go buy the magazine to see the entire article! 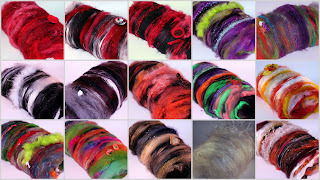 I will have more of the "Magestic Peacock" batt that's featured on the front page of the article, along with more of the "No Worries" batts that Jacey is using to spin in my update on Monday. If you put "FALLSPINOFF2010" in the message to seller I'll refund your shipping!! Once Again I FAIL at blogging!! I promise it's going to be different this time.. I know I know.. I say it every time.. and yet the entire summer has gone by without ONE post!! NOTHING!! Ok.. 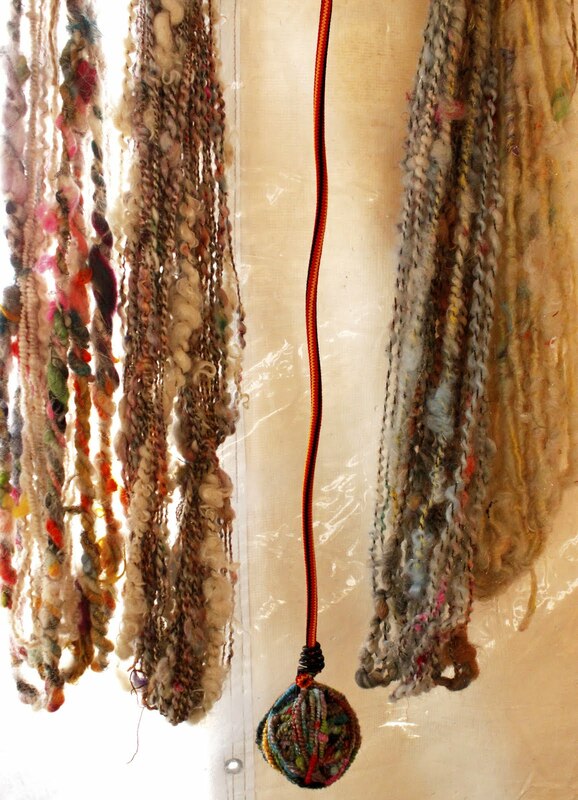 I'm still here.. LOTS has been going on in my life and in my studio/fiber life!! 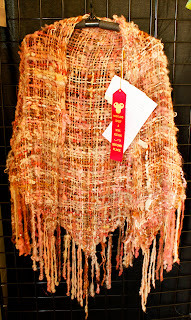 The Carolina fiber fest went well.. full post about that coming! It was an amazing first festival which only wet my appetite for more! Next year I'll be back.. I'm also planning on vending SAFF and maybe even YarnCon. I'm also applying for the Raleigh Handmade Market if I can get enough FO's done! PluckyFluff Asheville.. another full post coming soon.. but briefly it was amazing, of course. Lexi is just a blast to hang out with and a great teacher! I'm hoping we get to throw back some wine and chocolate again soon!! Teaching at SAFF- YEP!! I'm teaching my corespinning class this year at SAFF 2010! I'm so excited because this is the biggest venue I've taught at and my class was the THIRD of all the classes to fill up! I only got on the waiting list to vend since I didn't really think I would even try vending this year.. since I've never even ATTENDED *gasp* I know!! But I did so well at the at CFF that I figured I would go for it- As I'm still on the waiting list, I think I'm just going to plan on teaching this year (and I'll have batts for sale in the class) and then next year I'll be vending! I'm having a TRUNK SHOW!! You heard right.. Friday night, Oct 15th, from 6:30-9:30 join me at DownTown Knits in Apex NC for wine, snacks and and evening of FiberyFUN! More details to follow..
LOTS of new stuff is happening over in the shop!- which is it's own blogpost as well!! The fall season is upon is and the first batch of Halloween batts are listing today! 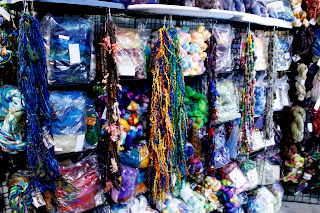 More will come over the next month including yarns, out of the bag fiber kits and indulgence tops! OK..so back to the shop update which is happening ALL DAY.. individual blogposts about important events are coming. I promise to be a better blogger and newsletter writer! Teaching and Vending at the Carolina Fiber Fest, May 21-23!! YEP!! I told you folks that the announcement was coming soon!! JazzTurtle Creations will have a vending booth ALL weekend at the Carolina Fiber Fest, May 21-23 at the Raleigh State Fairgrounds. Not only THAT.. but I'll be TEACHING my 3 hr "Creative Corespinning" workshop- Friday morning (either 9-12 or 10-1, not sure yet) I'll post a link when registration is open. Class is $65 and includes a spinning kit. Why corespin? If you want to learn a technique get the most out of precious fiber (like cashmere) or learn how to get the most texture and create funky art yarns, then corespinning is for you! First we’ll learn how to corespin, with proper attention to achieving a balanced yarn. 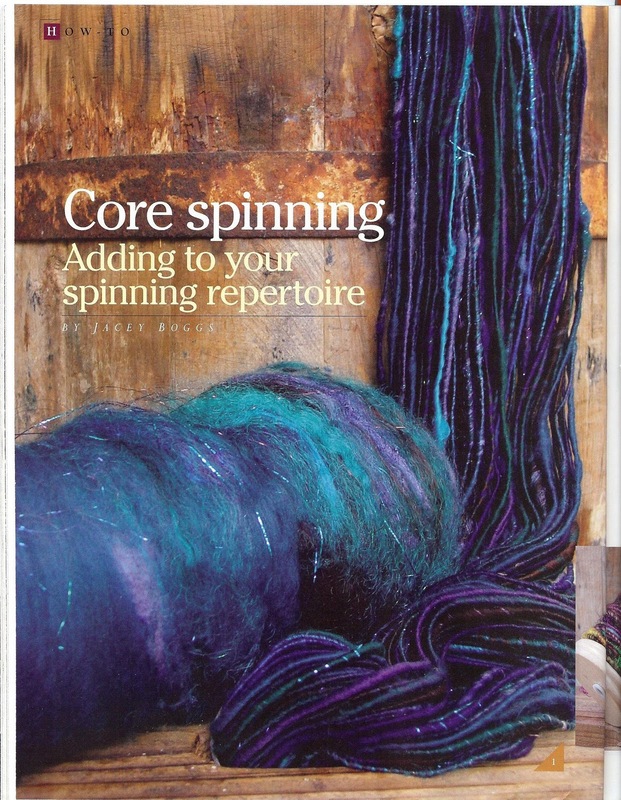 Then focus will shift to experimenting with different corespinning techniques- corespinning with locks, coreless corespinning and adding “fun stuff” into your yarns like felted nubbies, sequins, fabric, cocoons and other things you may bring. Translucent corespinning and carding textured art batts will also be demonstrated. 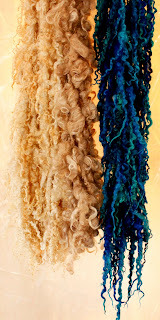 Class fee includes kit with core yarn, 3oz textured batt, 1oz loose locks and fun add-in’s. Additional supply details will be sent with registration confirmation. Participants must bring a wheel and be able to spin a single. Class limited to first 16 registered students. I will ALSO be doing free art batt carding and art yarn spinning demo's on Sunday afternoon!! If you're in the area please stop by and say hello.. and do some shopping while you're visiting! A tour of my studio-where the carding magic happens! Welcome!! This is what you see when you pass my studio. I've had a couple requests for a virtual "tour" so I thought I'd invite you inside and show you around. I did a bit of spring cleaning and organizing this weekend, so I thought it'd be a perfect time! You see my bin of treasure fiber is open and ready to collect leftover carding fiber. I also have a basket out with add in's I'm currently putting in batts and yarns. When you walk in you are greeted with my shelving unit of add in's and sparkle. Installing this above the desk and carding table is what really turned this room into a "studio" Previously it was all in "bins" that I would dump on the floor when I was working. There were 2 main problems with that.. first I couldn't see everything I had.. and if I don't see it, I forget it's there and don't use it! Most importantly is that I had to bend over and stand up again and again and again when reaching for goodies like sparkle and sari silk.. and I gave myself some vertigo by continued bending over and standing up.. I couldn't work for over a week. So installing this unit was a lifesaver. Everything I need is within reach and in sight! Top shelf is a bin of hand dyed merino top odds and ends, a bin of treasure fiber leftover from projects and a small bin of add in's like silk flowers, pom poms, crocheted flowers, buttons.. 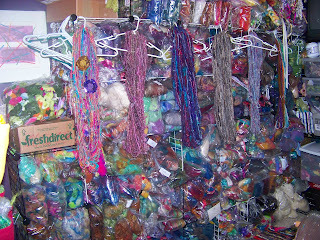 The middle shelf holds a small bin of novelty yarn snippets, another small bin of my sari silk stash (yarn, thrums, recycled tangles, ribbon and pulled waste) The middle big bin is full of fabric strips and silk for spinning and adding into batts. 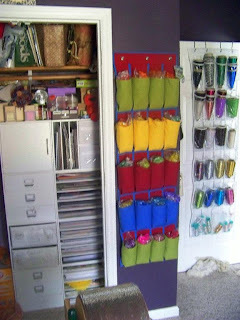 The bottom shelves hold my bins of lurex and silk thread, 3 colors of holosparkle lurex, and sequins (behind the holosparkle), my basket of hemp noil in rainbow colors, my bowl of felted nubbies and pebbles and my NEW set of 3 drawer units for my smaller add in's like shredded money, neps, silk cocoons, worry dolls, buttons, fabric flowers. These were previously in a basket and just getting lost! I feel SO much more organized now that I can easily (and quickly) get what I need! To the left of the desk you see my bookshelf with my smoothie carder on top (next to the drum I got in Cairo), my craft books and magazines, old textbooks and reference books from college and massage school, and on the top shelf baskets and bins with scrapbooking stickers, beads, sequins and crystals. angelina and lurex drawer.. every girl LOVES her sparkle drawer!! 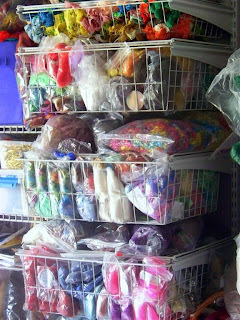 Then above that it's my noils and banana silk drawer. A rainbow of silk, bamboo and cotton noils, along with tangled strands of brightly colored banana silk fill this drawer. 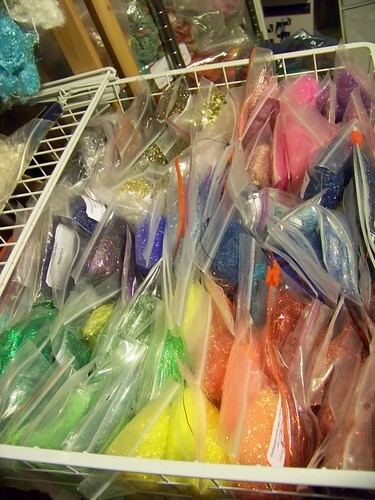 Above that is another sparkle drawer.. this one is filled with firestar and icicle nylon sparkle. Again, a rainbow of fibers! The top drawer has vintage trim and lace, some silk snippets and other things for carding into batts and spinning into yarn. 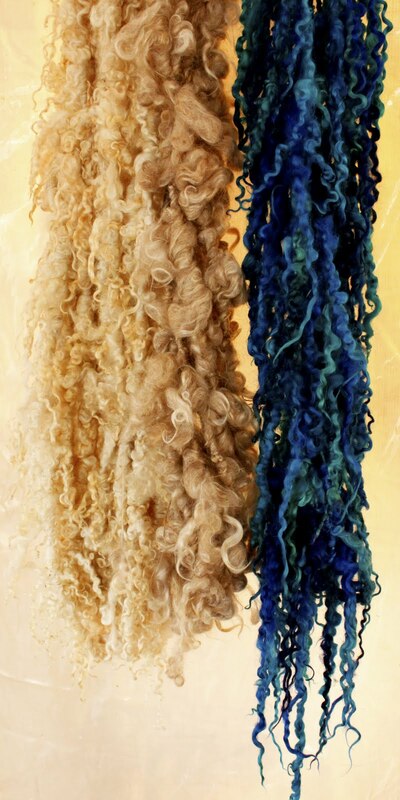 In between the drawers I have bags of brightly dyed curly kid mohair locks for adding into batts. Next to the carding station I have my wire rack of farm wools and fleece. These are mostly solid or semi solid fibers from animal friendly farms. I mostly card this fiber, but I also spin some without carding.. 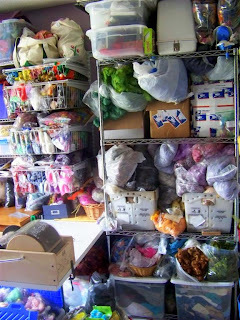 The bottom shelf is filled with bins of fiber, and the top shelf is my sewing machine, serger and other quilting supplies. 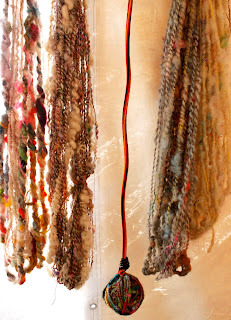 I use over the door shoeracks for holding my rainbow of kid mohair locks and some wrapping/plying yarns. No space is unused.. including on the wall and behind the doors! 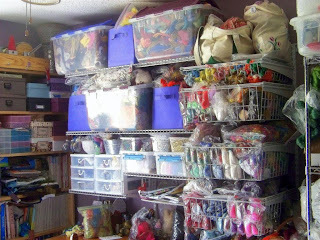 In the closet is my scrapbooking supplies. My fiber wall.. my home LYS.. my pride and joy. 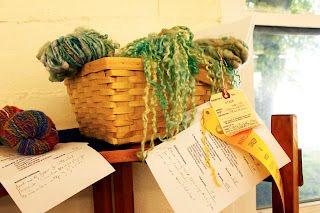 I often sit on the floor and plan yarns by staring up at all the colors and textures.. I often hang yarns I've finished to inspire me. This wall is made up of wire cubbies. The bottom cubbies are filled with top I use for carding. 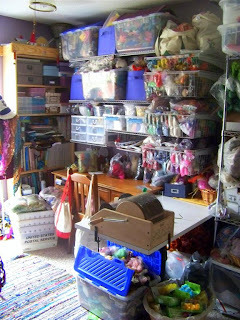 The top cubbies are shop inventory (except the last 2 are combed top spinning stash) The left side cubbies are all uncarded locks and fleece I plan to spin uncarded. This is also the cubbies I have my bamboo rayon designated for spinning not carding. The rest is all spinning stash. Mostly batts, some combed top and clouds. Some is created by me.. LOTS is from other independent artists like myself. I admit, as much as I love spinning my own fiber, I love to spin other people's as well. We all have a different carding style, so it's fun to play with other techniques. It is crazy though, I've collected this stash over my 3 years spinning.. I don't buy as much as I used to.. but there are still weeks when the mail comes heavy to my house!! Well, thanks so much for stopping by! If you're ever in the Raleigh/Durham/Triad area and would like to schedule a private lesson and come by for real, drop me a line and we'll figure it out!! 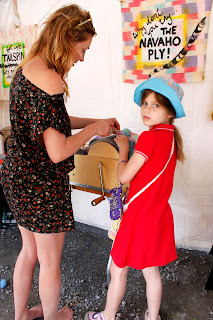 Thanks for stopping by the bloggersphere of JazzTurtle Creations! 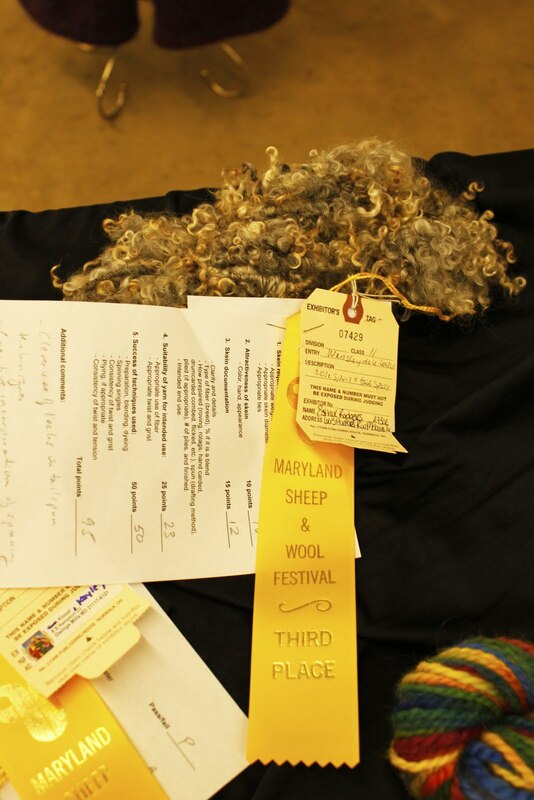 Maryland Sheep & Wool Fest 2015!! Not sure where I will land... but there are new yarns!